Devil's Postpile National Monument is located near the Mammoth Mountain in Madera County of California. Devil's Postpile National Monument was founded in 1911 and is designed to protect Devils Postpile - this is an amazing formation of basalt columns. The national monument covers an area of over seven hundred and ninety acres and includes two tourist attractions. 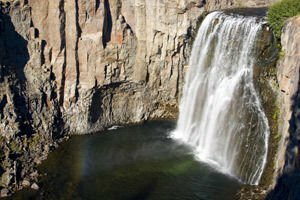 These are the columns themselves and the beautiful Rainbow Falls, which is located on the San Joaquin River. Rainbow Falls was sacred to the ancient Indians. Today many people are attracted to it, because of the fact that besides being beautiful in itself, if you look from a certain angle, it creates a real arc. Known today as Devil's Postpile National Monument, this area was previously part of Yosemite National Park. In 1905, the Devil’s Postpile formation and Rainbow Falls waterfall, and the Minarets besides them were removed from the boundaries of Yosemite Park. 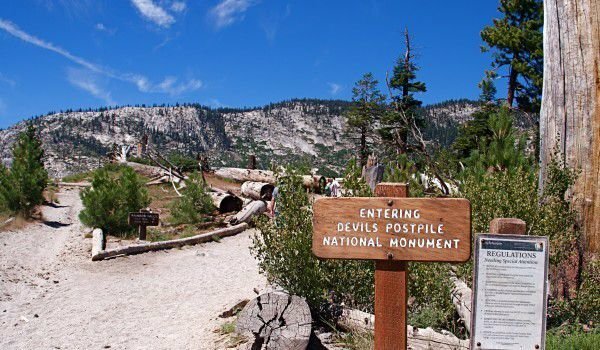 The discovery of large deposits of gold in 1905 at Mammoth Lakes led to the forced removal of the Devil’s Postpile from the boundaries of Yosemite Park. Later the proposal arose that the unique formation of basalt columns to be demolished and a dam on the San Joaquin River be built. Only the intervention of influential Californians was able to stop the destruction of the amazing creation of nature. In 1911 President William Howard Taft issued a decree to confer the status of a national monument on this site. Devil’s Postpile columns were created by lava flow from a hundred thousand years ago, but according to some experts this could have happened even earlier - more than five hundred thousand years back. The flow of lava had passed through the San Joaquin River and then was heading to the site of the Postpile. It reached a density of six hundred feet. Because of greater density, the majority of hot lava cooled slowly and gradually, thereby forming high, symmetrical columns. Later part of the cooled lava was moved by a glacier and so, the upper Postpile is very smooth, looks like it was polished. The columns of Devil’s Postpile reach sixty-one cm in diameter and many of them are eighteen meters high. They approach each other and look like a giant fence. Because of the uneven cooling of the lava, the columns have a different number of sides. Some of them have five sides, others with four, there are some with seven sides. Unlike other similar basalt formations, the Devil's Postpile columns contact each other vertically and they lack a fully horizontal alignment. The basalt columns of Devil's Postpile are amazing, but not the only ones on the globe. Such columns are also found in Ireland - they are known as the Giants Causeway. Yellowstone National Park, in Wyoming has them too. They are known as Sheepeater Cliff. Basalt columns are also found to be in Lajitas, Texas. In Russia there is also formation of basalt columns - known as Stolbchaty. Plants and animals within the area of Devil's Postpile National Monument are typical of the Sierra Nevada. Black bears, squirrels, deer, coyotes running through meadows covered with beautiful wildflowers.